At the ripe young age of 28, Krissy Moehl has already shown to be one of the best ultrarunners racing today. If 2006 is any sign of what's to come, she has only begun. Coming off of a successful 2005 season where she became the youngest finisher/winner of the Ultra Grand Slam (20:53 at Western States, 18:41 at Vermont 100, 22:03 at Leadville, and 26:34 at Wasatch), this Washington native has been demolishing course records and clocking top finishes all over the world. In 2006, she crushed the course record at the Leone Divide 50m (7:42, 9th overall), finished 2nd female at the Miwok 100k, and trounced all the men and women at the Where's Waldo 100k with an overall win (11:18, besting the previous record by Kami Semick by 45 minutes, and only 9 minutes off the overall course record set by Andy Jones-Wilkins; read Krissy's race write up here). I caught up with Krissy over e-mail to see how her recovery is coming. First, let me say congratulations on your finish at Where's Waldo! It sounds like you had a great race. Were you expecting to do so well? Leading up to and starting the race I really didn’t know what to expect. A week and a half before race day I finished thru-hiking the Colorado Trail with Andrew Skurka, and I didn’t know how all of those long slow miles would factor in. Where's Waldo has capped a fantastic two year run for you. What do you attribute your success to? I’m doing what I love to do. It seems like a simple answer I guess, but trail running is me, it is a part of how I identify myself, a runner. Because of this all of the time and miles that go into training are a way of life and fun – training is never work. If it becomes a chore and not fun then it is time to take a break. I guess that is another thing that helps, I really try to listen to my mind and body and take time off when necessary rather than being forced to take time off from an injury. Have you always been a trail runner? How did you get into it? When did you start ultras? Nope. I started running track in grade school and continued with track and cross country till my junior year of college. I was a team runner and needed a coach to motivate me to run. When did you start ultras? My first ultra was the Chuckanut 50k, March 2000. Scott McCoubrey and Uli Steidl ran the whole way with me. In that run Scott made sure I was well hydrated and talked to me a lot about fueling early. Since then you've raced all over the world. What are some of the highlights of your career so far? Working at Montrail for five years afforded me the opportunity to experience trail running all over the nation and the world. My favorite part about traveling in the US to ultra trail events is no matter where I’ve been my experiences always proved that you easily slip into the ultra community. It is one big family, worldwide really. Especially in the US, traveling to various states each community is unique but belong to the same family and therefore accept you in as one of their own. Competing in the Grand Slam last year allowed me to run in and see four 100 milers that I may never have experienced. The diversity of terrain was complimented by the uniqueness that each race organization brought to their event. Prior to that I’ve traveled to Virginia, Texas, California, Oregon, Florida, Wisconsin, Colorado, Vermont, Utah always to see and share in peoples’ favorite trails; it is a wonderful way to learn a bit about another part of the country. Traveling and racing internationally brings such great experiences in learning different cultures, hearing languages and enjoying the variety of foods. In all of my travels I have had the most amazing hosts, people that go over the top to share their home country. Highlights include running with a Montrail sponsored team of women (Stephanie Ehret, Janice Anderson & Francesca Conte) at the Oxfam Trailwalker 100km in Hong Kong 2002. This was the longest distance I’d run up to that point. To have the opportunity to run with such experienced and talented women was an inspiring way to do it. In 2003, partially through work, I traveled to France to compete in the Tour du Mont Blanc 150km. This is probably the most memorable and challenging race I have ever competed in and therefore also the most rewarding. The weather took a turn for the worst and in minimal clothing and a super tight IT Band I walked the last 30 miles to the finish. In the fall of 2003 a group of us traveled to Japan for the Hasegawa Cup, a 70 mile race on some of the most technical trails I have ever run. April of 2005 I had the incredible opportunity to travel to South Africa and compete in the Addo 100 mile. Only 11 people started, myself the only female, on the relatively flat and fast point to point course. We included some vacation time and in a month saw some spectacular sites including the Otter Trail, Kruegar Park, Cape Town, Johannasburg and Addo Elephant Park, where the race was held. What is it that motivates you to stay at it? I am constantly inspired by people around me. Those that set goals, put in the time and achieve them keep me motivated to do the same. I love hearing trail and race stories. I also love introducing new people to the trails. Seeing their faces light up after their longest run ever, or finishing a race are definitely motivators. 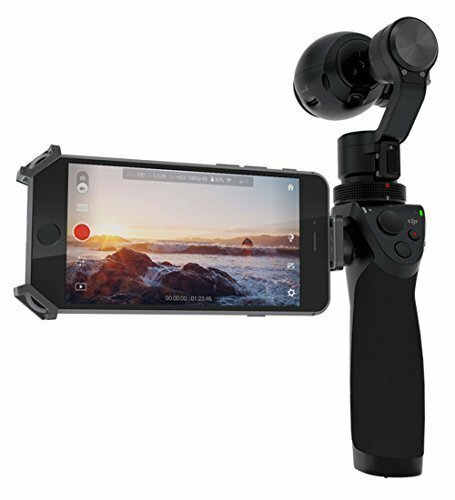 I would like to ask a few training questions. What does a typical training week look like for you (miles, types of runs, etc.)? There is nothing typical about my training, every week varies and really depends on what is on the horizon for racing. I try to get in a couple (2-3) 2+ hour runs a week, preferably on trail, I like to cross train, so (even though I’m a fair-weather rider) I ride my bike, use the elliptical machine, attend yoga classes and lift weights. If the opportunity arises I love to paddle, I’m trying to surf, I’d love to have a better appreciation for skiing/snow sports and am game to give almost anything a try. When feeling good and gearing up for a race I usually run every day, or at least do something every day. I think consistency is the most important aspect to training; keeping the body prepared for and used to running. Do you train with a club, friends, or go solo? Mostly solo, purely out of timing reasons, but I in my travels I am meeting up with people for some great runs. In Seattle I do try to get out with friends. There is a group of girls that met Wednesday mornings for an hour or so and another group that has weekly training that I’ve yet to make. For all of the long runs (4+ hours) it is much more enjoyable to train with friends; we have such a great ultra crowd in the Northwest. I like to keep it varied and train in as many new places as I can. Do you target a few races a year, or race as much as you can? I like to race as much as I can, that said I make a point of not over racing and taking down time to recover. What do you like to eat before, during, and after a race? I’m a whole foods type of girl, lots of fruits and veggies, tofu, beans, fish and chicken once in a while. Those that know me well also know that I don’t skimp on the sweets, I do love ice cream and hot chocolate is a staple. What races are you tackling in the second half of '06? Any big goals beyond that? I’m looking forward to the Durango 50k, Santa Barbara 9 trails 35 miler and Hellgate to finish off the year. Next year I hope to run HURT 100miler, Hardrock 100 miler and the Tour du Mont Blanc 150km. Can you tell us a bit about your sponsors? I feel fortunate to have built some great relationships with my sponsors. For the past 5 years Montrail (shoes), Clif Bar (nutrition), Smartwool (socks), Petzl (hands free lighting) and Patagonia (clothing) have made up the sponsorship of our ultrarunning team, provided all athletes with incredible products and most importantly supported the sport of ultrarunning. 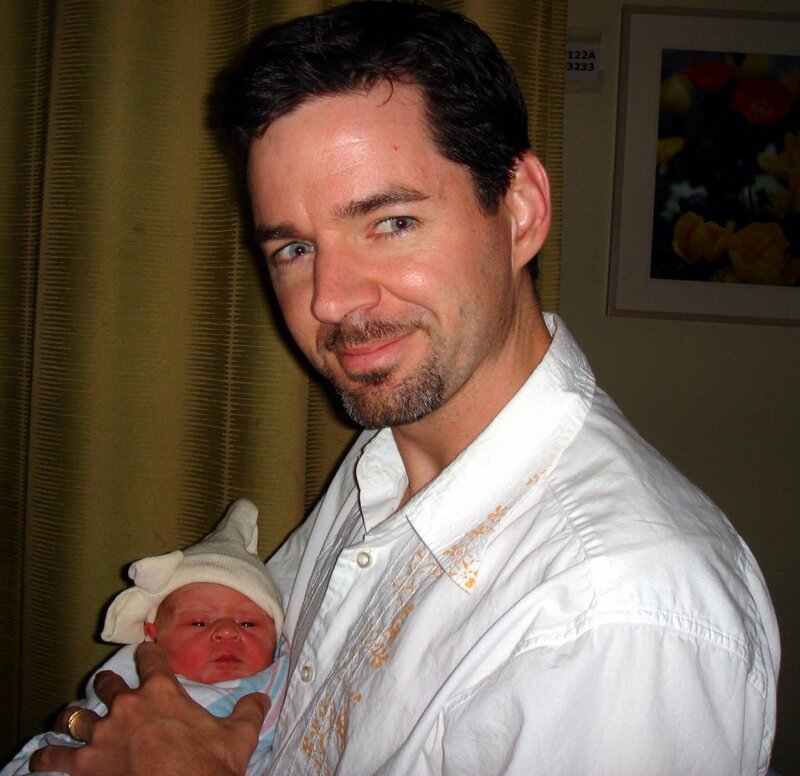 In 2005 First Endurance and Nathan joined the team of sponsors and in 2006 Nathan became the co-sponsor of the team. First Endurance is hydration and recovery for me and was definitely the products that helped me in-between each of the Grand Slam races. Nathan knows how to take feedback from users and apply it to make functional hydration systems and have a line for women that really considers what women need. I have only ever run in Montrail shoes and am thankful that I still have all of my toenails. Clif bars, gels and bloks not only feed me on the race course but sustain me daily. 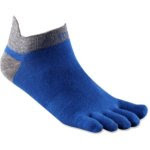 Smartwool is part of the foot system that keeps me blister free, and keep me warm even while wet. 100 milers wouldn’t be possible without the night vision of the Tikka plus and Myo5. And head to toe, underwear to jackets I am a Patagonia girl, on and off the course. I love your new blog. What have you enjoyed about blogging so far? Thanks! 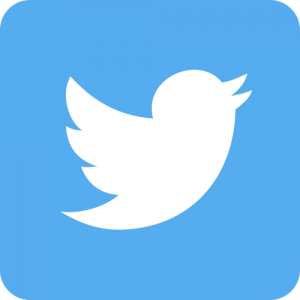 It is a great to have a place to keep a record of adventures and experiences for reference for myself and have them all in one place to share with family and friends. My Mom likes it so she can keep track of me too. Thanks for a great interview, and best of luck this season! In his brief four years in the sport, Dr. Jasper Halekas has clocked some impressive times at races like the Headlands 50k, Miwok 100, American River 50, and more. He has successfully transferred his mountain climbing background into blistering off-road speed, and continues to get faster. 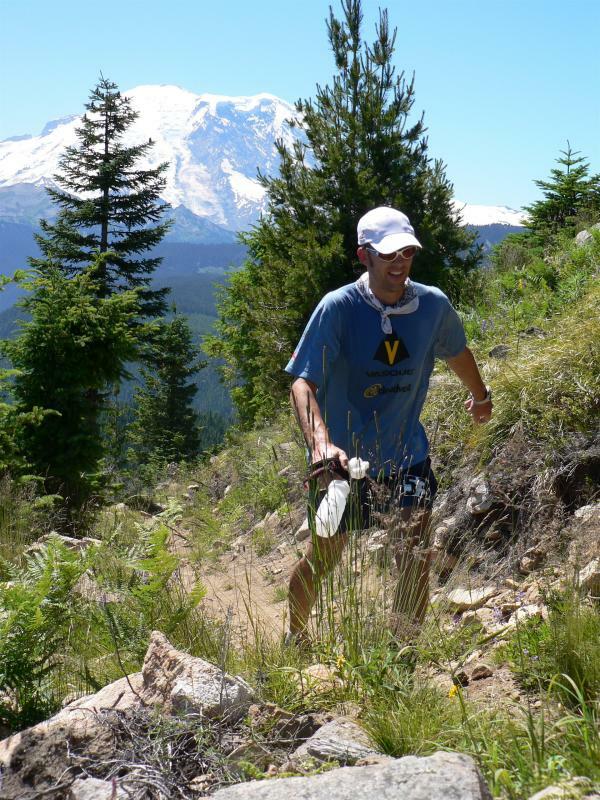 In 2004, he won the Diablo 50 miler in a course record 8:59, despite the 100+ heat and 11,300’ vertical. 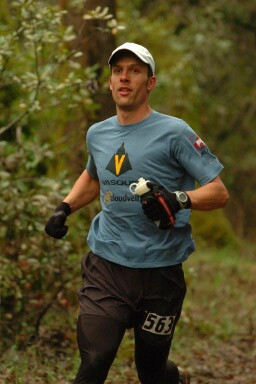 In 2006, he placed 2nd at the Bear 100 and 7th at the Across The Years 24-hour run. But it was his 1st place finish at the inaugural 2006 Tahoe Rim Trail 100-miler (20:16) that sealed his fate as one of ultrarunning’s elite. 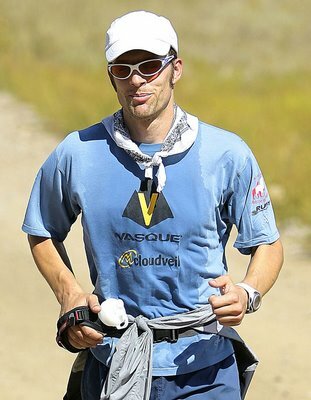 I caught up with Jasper over e-mail to see how he’s doing, and learn if his PhD in Planetary Physics from UC Berkeley gives him an edge in ultrarunning. Thanks for the interview, Jasper. First of all, thanks for having me on here. 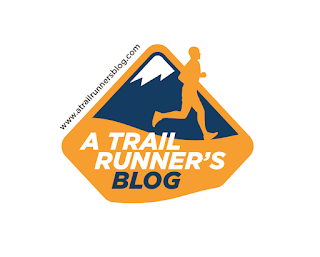 I read your blog on occasion, and always appreciate the opportunity to learn more about some of the other ultrarunners out there that I don't know so well. I don't live up to the star power of some of your other interviewees, but I'm honored to join that select group! Thanks for the flattering bio, too. Also, I want to congratulate you on the new addition to your family. Getting any sleep yet? I’m getting some, but not much! Before I forget, congratulations on your win at TRT! You looked great when I saw you on the course, and your rivals never caught up. What led to your success? Thanks! You looked great when I saw you too, and it sounds like you had a successful run in the 50m as well. As for my race, it was just one of those rare things where everything went perfectly. I raced hard all spring, running Way Too Cool, AR50, Boston Marathon, and Miwok. Then I cut back on the racing and just trained hard for about 8 weeks before TRT. I never got hurt, and other than a bad case of poison oak from the Dipsea, never really had any setbacks in my training. I also ran the whole course in training, which was a big help on race day. Then on race day, everything went perfectly. I ran the first 25 miles with Rod Bien, which was really pleasant. Rod's a great guy and fun to run with. We were surprised to find ourselves in the lead of a 100, but neither of us felt like we were pushing, and we just had a good time out there. After 25 miles I pulled ahead a bit, and I actually led the race alone from that point on. Not to say that I didn't get some scares - at mile 75 at the turnaround, I found to my dismay that Brian Robinson was very close behind me and looking strong. Brian is an incredible powerhiker, so for the rest of the race I was looking over my shoulder on all of the uphills, sure that he was about to catch me. Every time I saw the headlights of the safety patrol guy on his mountain bike, or caught a glimpse of the Moon, I was sure I was about to get passed. As it turns out, Brian had some troubles with his hydration and electrolytes, and finished a bit behind me. Watch out for that guy in his next few 100s, though. His presence behind me certainly motivated me to finish strong, I can tell you that. Did anyone crew for you? Actually, I went without crew or pacers at TRT, as I did at the Bear. I've found that I can do pretty well out there on my own. Not having crew means that I'm not tempted to waste time at aid stations, and not having a pacer means that I don't have anyone to whine too. I think the right pacer and crew can definitely be an advantage, and I probably will run with pacers and/or crew on occasion in the future, but not having them doesn't bother me too much. At TRT, it was actually pretty nice even without a pacer, because you saw people so often on the out and backs. Every one out there was super friendly, and it was nice to always be exchanging pleasantries with other runners. With your win at TRT and 2nd at Bear, I think you can officially consider yourself a 100-miler. Will you be doing more in the next year? I do like the 100s. I think there are few things as rewarding as finishing a 100 mile run. If only it didn't take so long to recover from them... I certainly plan to run more, though, as long as my body holds together. I have a long list of 100 mile races that I'd like to try, but my top priorities are probably (in order) Hardrock, Western States, and Wasatch. I've paced at all three now, and really want to run them all. Hardrock especially is the king of 100 mile races to me - I just wish it wasn't so hard to get into. How did you get started in ultrarunning? Were you always a runner? Nope, I've only been a runner for a little longer than I've been an ultrarunner. I was a climber and skier when I was younger, and then I played ultimate frisbee for the University of Washington (in college) and U.C. Berkeley (grad school) club teams, as well as a couple of Bay Area club teams after I ran out of college eligibility. My running can be blamed on a couple of my former ultimate teammates, though. Though I had never run more than ~5 miles before, they convinced me that it was a good idea to sign up for the 2003 Big Sur marathon. Before that, I always thought running was the horrible thing people did to train for other sports. Once I started marathon training, though, I was hooked. Before I even ran the marathon, I was researching these things called ultramarathons, and it pretty much seemed like an obvious path from there. I ran my first 50k that year at Skyline, then my first 50m at Firetrails, and then went on to the HURT 100m in 2004. That was a bit of an accident, actually. I lost a bet to my friend Ethan which committed me to running the HURT 100k. What is it that you enjoy about the sport? For me, this sport is all about pushing your limits, and finding out that you can do things that you never thought possible. That, and the endorphins. You run for the Vasque Ultrarunning Team, yes? What’s that like? Yes, I've been with the Vasque Ultrarunning Team for three years now, which has been a fantastic experience. Ethan gave me a shot when I was brand new in this sport, and had no business being on a sponsored racing team. I'm still one of the comparatively slow guys on the team, but I like to think that I've been able to justify my existence to some degree. Running for Vasque has been really wonderful. From the start, it has been a true team, rather than just a group of sponsored runners. This is largely thanks to the efforts of Ethan in recruiting a bunch of people that are not just great runners, but also great people, and making sure that everyone on the team are treated as equals. We're all friends, and we help each other out at races whenever possible, train together when we're in the same area, and get together at least once a year as a team. I've paced or crewed for a half dozen Vasque runners (including Carol O'Hear last weekend at AC - Congrats, Carol! ), and they've been there to help me out, too. I see you have a PhD from UC Berkeley and research planetary physics. Do you have a special relationship with gravity that helps on your ultra runs? Do you study the auroras of mars during your night runs? Nope, gravity hates me, just like everyone else! And you might think that I spend all my time thinking about abstruse physics questions when I'm running, but actually running is my time away from everything. I like to not think about that much at all when I'm running. Running is my therapy as well as my recreation. Are there many ultra runners in your line of work? There are a few. I know a couple of physicists that are ultrarunners, including the famous Blake Wood. Most of my co-workers just think I'm a little touched in the head, though. Can I ask you a few training questions? What does a typical week look like for you (mileage, types of workouts, etc.)? Do you cross-train, or mostly run? I mostly cross-train when I'm injured or not really training for anything specific. I like to road bike, but I can't find the time to do it when I'm also running at full capacity. I find that I need a lot of rest when I'm doing more than 50-60 miles of running a week. How many races do you do each year? I've been averaging around 10 races a year, of which 5-6 are ultra distance, and the others shorter. To steal a line from a friend of mine, I want to be not just an ultrarunner, but a runner. I like to do some marathon and shorter races every year. For instance, this year I did Boston Marathon and the Dipsea, as well as a couple of the Pacific Coast Trail Runs events, which are the best organized and most fun trail runs around. Anyone who hasn't run one of Wendell and Sarah's events is missing out. What’s your favorite thing to eat before, during, and after races? Before races, I eat anything and everything, and lots of it. My diet is probably not the greatest, though it's not terrible. That's definitely a bonus of running for me - I don't feel bad about eating some junk food here and there. During races, I rely largely on gels and energy bars, but I also like cookies and PB&J, sometimes some fruit or candy. Right after races, I usually can't manage anything except soda. Once my stomach recovers a bit, though, my two vices are ice cream and beer. Where do you find the motivation to train? Motivation is never a big problem for me. I have a lot of things I still want to do in ultrarunning. I went on a blind date with a girl last year, and after about 20 minutes she said, "You're very goal-oriented, aren't you?". Do you think she meant that in a good way?? Anyway, I always want to do more races than my body can really handle. For me it's more a matter of trying to be smart and limiting myself to a training program that won't leave me injured. What’s next for 2006? Any races targeted beyond that? I'm running the Tsuneo Hasagawa Cup (a 71.5 km mountain race) in Japan in three weeks. After that, I'm thinking of doing Quad Dipsea. Then, next year I'm going to apply for Western States, Hardrock, and Wasatch, and hope I get into at least one of them. Best of luck in Japan, and I hope to see you at the Quad Dipsea. Thanks for a great interview! Bradley Melekian wrote an interesting article in the New York Times today about how the increased demand for "easy access to trails" is changing how land and home developers plan for new communities. Golf courses are out, planned open space is in! 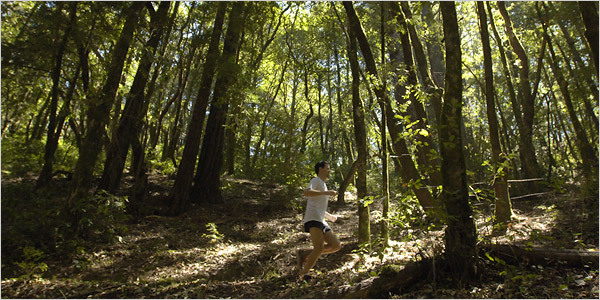 Not only is trail running growing in popularity, it is now the #1 amenity that potential home owners seek in a new community (according to the National Association of Home Builders). Nancy Hobbs was even quoted to say that home developers have become an interesting ally to the trail running community. Be sure to check out the article for more interesting facts. Darcy Padilla came down from San Francisco to take the snapshot of me on page E9. This is along the Skyline Trail, just across the street from Kings Mountain Road. Darcy is awesome, and made great use of some hard light that afternoon. Thanks again to everyone for their congratulations on our baby. It meant a lot to me that you all would stop by and leave a note! She and mom are doing great, and Rocky is thrilled to have a new pint-sized friend in the house. I know it's not trail running-related, but I just can't help myself from posting the big news. I became on dad on Friday! Sophie Jane was born on September 1st, 7 lbs and 4 oz. Mom and baby are doing great. 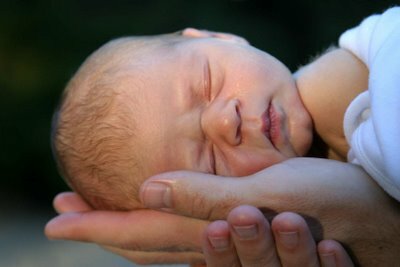 The whole birth process was incredible. Christi was amazing. I will say this much - after "pacing" Christi through the labor, I think every mom should get an honorary membership into the ultrarunning club. It has all the same elements - courage, pacing, hydration, the equivalent of 2,000 sit ups, and you feel like you've been hit by a train by the time you're done. Bravo to all Moms! My sleep deprivation skills should be in top form by the Tahoe 72 in four weeks. Let the fun begin! I will see y'all soon.